I truly love living in a region where I get to experience the joys of 4 distinct seasons. Each one, for me, brings to life it's own unique characteristics. It introduces itself through scents, flavors, sounds and feelings. and it is definitely in the air!! The days around here are still lingering in the upper 80's, but thankfully the intensity of the heat is beginning to lift, making way for mornings cool and crisp, and evenings brisk with chill. All of it gets me so so excited for every single little autumn delight - pumpkin patches and hay rack rides, football, football, football, cozy sweaters, beautiful leaves, steaming cups of hot coffee and tea all-day-long, and a house filled with the scents of fresh baked goodies. Okay, so somedays that's just the cinnamon bun candle burning, but other days life in the kitchen does produce more than PB & J's....and those days are wonderful! In honor of fall, this week's posts will be completely dedicated to all of the glories of the season - food, home decor, school projects, etc. Over the weekend, I was thinking about my sister-in-law, Stephanie, who is amazing and about to bring a new little life into the world. She LOVES Starbucks pumpkin spice lattes. Thinking of her inspired me to create a recipe for Pumpkin Spice Latte Biscotti. If you're a coffee or tea sipper like me (all day long, please! ), then you know how a yummy piece of biscotti can take it up a notch! 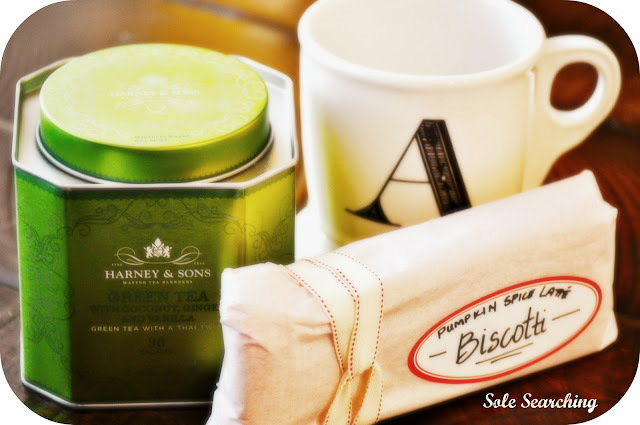 Biscotti also makes a wonderful gift - just wrap up a few pieces in some parchment, stick on a lovely label and assemble with a cute mug and a lovely tin of tea or bag of coffee. I'm thinkin' it might make a great Thanksgiving gift for teachers or grandparents. The kids can attach a little note with why they are thankful for that special person. 1. Preheat oven to 325*. 2. In a large bowl, whisk together flour, both sugars, salt, baking powder, and pumpkin pie spice until combined. 3. In separate bowl, use a fork to blend together pumpkin, eggs, melted butter, vanilla and dissolved coffee. 4. Add wet ingredients to dry ingredient mixture, stirring well until combined. The mixture will be dry. 5. Turn dough out onto a lightly floured surface, and knead 8-10 times. 6. Shape dough into a roll, about 16 inches long, and flatten to 1” thickness. Here's a visual of the "roll" shape. Out of the oven and ready to be sliced! 7. Bake for 30 minutes. Remove from oven and let cool for 10 minutes. 8. Reduce oven temperature to 300*. Be sure and use a serrated knife for a neat, clean slice. 9. Transfer roll to a cutting board and, using a serrated knife, slice into ½” thick pieces, cutting at a slice angle. The pieces will still be slightly moist in the center. 10. Place each biscotti piece onto a baking sheet with the cut side facing up. Bake for 10 minutes. Flip pieces over and bake for another 10 minutes. Remove biscotti from oven and cool on a wire rack. 11. Once cooled, drizzle the biscotti with melted white chocolate, or dip ½ of each piece into the chocolate. (To melt, place white chocolate chips in a glass bowl with shortening. Microwave for 30 seconds then stir. Place back in microwave for 15 second intervals and stir until chocolate is smooth and melted.I like to add a dash of the pumpkin pie spice to the chocolate for a little something extra.) Store in air-tight container. Enjoy!! What do you love best about Fall?? I always think of you when I drive by a Starbucks! We're counting down the days until Phoebe's arrival!! I will hav eto rty this!! It looks yummy! My girls are so young that it's fun experiencing the season with them. Seeing my 3 year old discover leaves and pumpkins and my 1 year old tasting the yummy foods of the season for the first time! Can't wait!! I never tire of taking my kids to the pumpkin patch in the fall. Have you been to Johnson's farm?? That was always my kids' favorite! I miss KC so much!! Thanks for sharing this recipe! Chris' mom makes biscotti every year for the holiday season and Devin has been asking if he can help her make it. Since they live out of town this hasn't happened yet, but it made me think I should try to make some with him. They love pumpkin anything, so I'm sure they'll love this. So excited for fall...wearing jeans today for the first time this season, woo hoo! HI Carrie!! 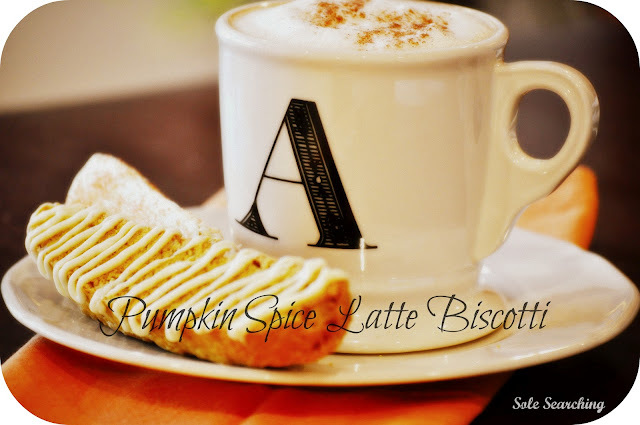 I love any kind of biscotti, but I was feeling inventive, so this recipe is new for me. I think it turned out yummy - it passed Steve's test, and he's a tough judge!! I'm ready for jeans too...and sweaters :). MMMMMMMMMMM that looks delish!!!! 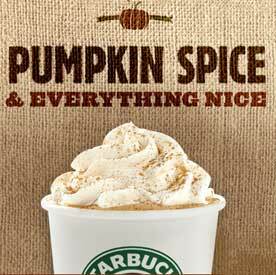 I had my first pumpkin spice latte on Saturday. Now it's time to make pumpkin bread and pumpkin muffins. It passed Grandpa and Grannies taste test, as this along with a beautiful dinner was delivered to our house. Thanks, Susan and George! Yummy! I will definitely have to try these! Thanks for sharing. P.S. I'm a runner too! My mouth is watering! - I love biscotti!! - thanks so much for sharing on my blog hop!